מה לגבי 'מסירות' במקום מחויבות? טוב לא משנה, הוא אידיוט. Isn't it against Jewish beliefs to even get at tattoo? Yep, it's against the Jewish beliefs. That's why most people who get the Hebrew tattoos are Christians. You can even see how the majority of tattoos on this site uphold Christian values. 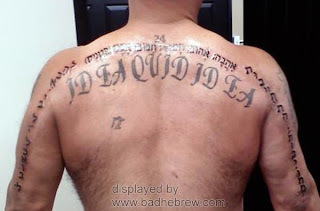 Funnily enough, those Jews who do get a Hebrew tat, often do a memorial, EXACTLY the kind of thing forbidden in the scriptures. and most jews don't keep kosher and stay true to other jewish beliefs... so what's the big friggin' deal here? Nope, no big deal at all. I'm not saying Jews shouldn't get tattoos or eat shrimp. It's just celebrating one's Jewish identity by doing something religiously forbidden, that I find ironic. OMG this guy actually wrote "Zero(in Tennis)"
Did he actually have the page number for the Ahava entry written on top as well? Or what the heck's "24"? And is that a floating chai lower down? Wow. This is stupidity, not ignorance. If you look in ANY dictionary in ANY language there will not be one word as translation, because that is not how languages work. This is not a matter of someone with no knowledge of Hebrew getting a misspelled tattoo. This is a matter of someone who doesn't know anything about languages other than his own. Someone who thinks every word in his language has an exact translation in all other languages. That takes a special kind of stupid.